Birth date and place c. 1832 Bandon, Cork, Ireland. Physical Description Height: 5 ft. 8¾ ins. Complexion: sallow. Eyes: hazel. Hair: dark brown. 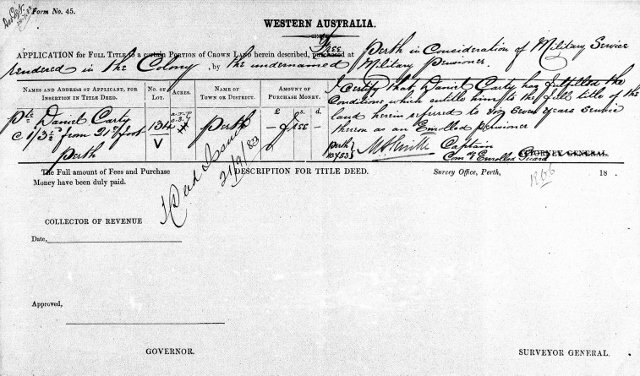 Marriage date and place 1888 Perth (2nd marriage). 2nd Catherine O’HANLON (widow of Hugh O’Hanlon). 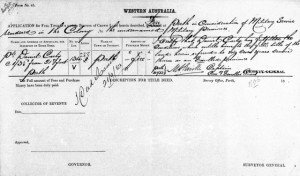 Death date and place 1 Aug 1923 Cottesloe, Western Australia. Death Notices and Obituaries Daily News 6 Aug 1923. West Australian 6 Aug 1923. 2nd Bn. 21st Royal North British Fuzileers. Regiment No. and Rank #2723 Private. Attestation date and place 30 Sep 1851 Cork. Crimea 1 year 9 months. Nova Scotia 5 years 11 months. East Indies 3 years 10 months. 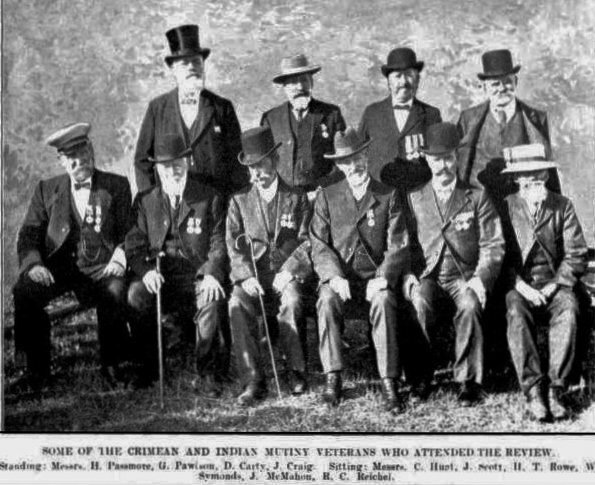 Musters 1871 Chatham [WO12-4053]. On detachment to 2nd Bn. 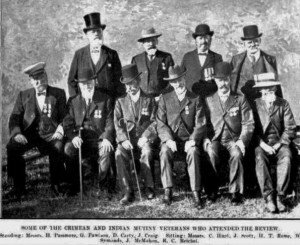 23rd Royal Welch Fusilliers. Long Service & Good Conduct Medal. Gratuity £5. Regimental Courts Martial None. Four entries in Regimental Defaulters Book. District Courts Martial Dublin [WO86-007-31] Click here for record. Trial: 17 Aug 1852 Disrespectful conduct in not saluting his officer. Sentenced: 56 days Hard Labour. Total period of Imprisoned 9 Aug to 10 Oct 1852 [WO97/1911/146]. Discharge date and place 7 Jan 1873 Stirling Castle. Length of Service 21 years 37 days. Chelsea Pension Reference WO97/1911/146 and WO121/0224. Post Discharge Pension District 1st London. Greenwich (1873). Perth, Western Australia (1874). Pension Amount 1/1d. Increased to 1/3½d. per diem on 1 Jun 1881 for service EPF. Enrolled Guard 11 Nov 1880 until disbandment 31 Mar 1887. Janitor Perth Railway Station for WA Government Railways. Land Grant/Purchase 21 Sep 1883 Perth Town Lot V134. Grant. Misc. Newspaper Articles Perth Gazette 20 Feb 1874. 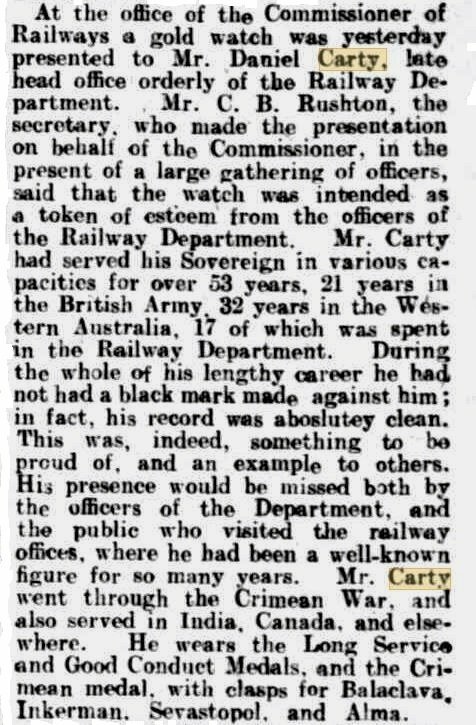 Western Mail 27 Nov 1909 (King’s Annual Birthday Review). 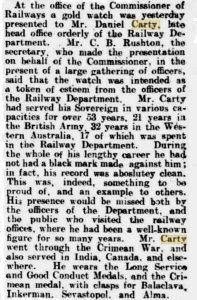 West Australian 1 Mar 1907 (Retirement presentation from Railways Department). Daniel Carty’s Crimea War Medal and clasps in a ‘nest’ with Hugh O’Hanlon’s medals. 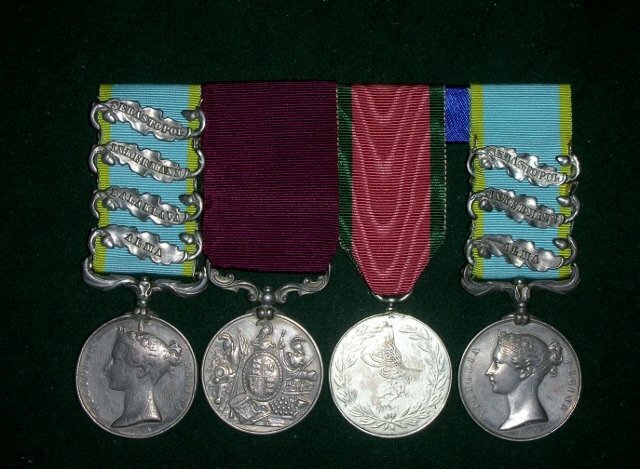 They are in the medal collection of Burridge Military Antiques, Swanbourne, Western Australia. Arrival of Naval Brigade [Perth Gazette 20 Feb 1874]. 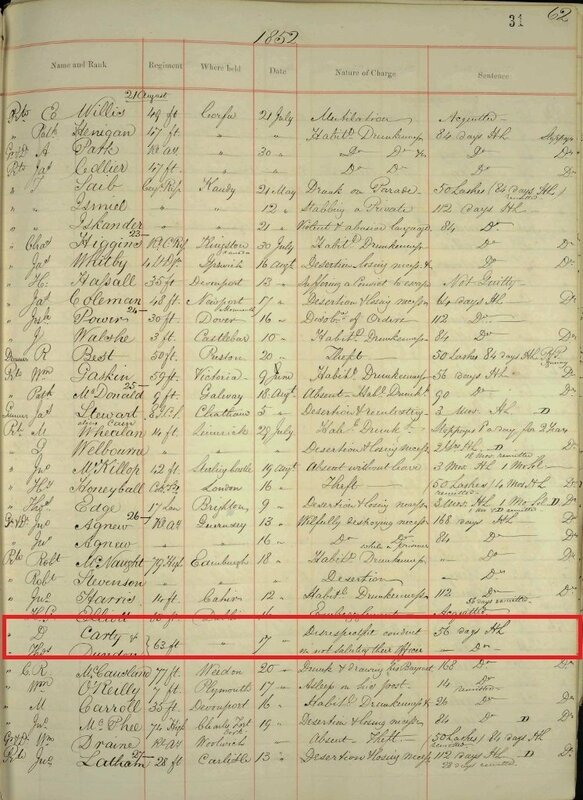 Daniel Carty’s Land Grant for Perth Town Loc. V134. The Annual King’s Birthday Review in November 1909. Daniel Carty is standing third from left.